Easter came late this year so there’s still time to find the perfect place to brunch on that Sunday with the family! Amongst the variety of amazing restaurants in Orange County there are a few that go the extra mile on Easter! We know it can be overwhelming trying to find the perfect place, so we have laid out a few options for you to choose from! Check out these great spots for good food, gorgeous views and a great time! If you are an Orange County native, you know you can never go wrong with Pelican Hill. As if the breathtaking views of the serene coastal line and enormous infinity pool weren’t enough to send you over the edge, the food at The Coliseum is divine. The outdoor seating allows couples and families to look out over the bright green golf course and Pacific Ocean, and is the perfect place for a sunny Easter Sunday. The brunch is buffet style with all the classics like waffles, eggs and sausage as well as a few extra items! You can even lounge around all day after brunch and stay for the Easter dinner they serve. This restaurant fills up quick for lunch so make sure to call soon if you’re looking to make reservations! 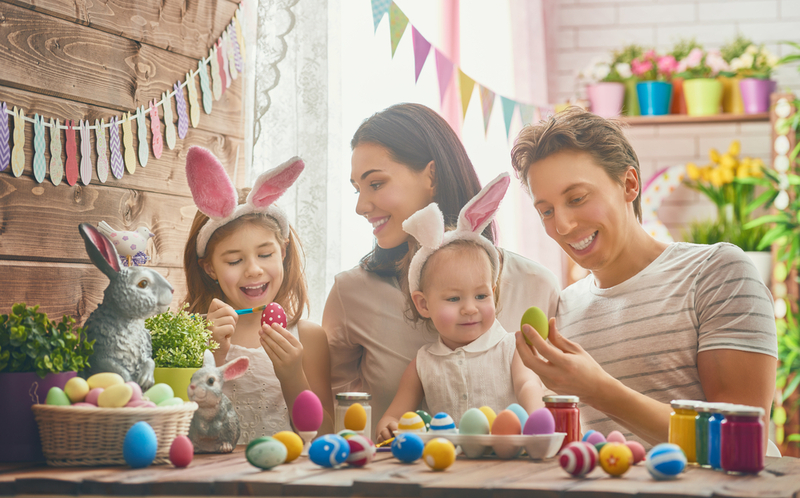 Nestled in the heart of San Juan Capistrano, The Ramos House Café can be the perfect place to take the family for Easter brunch if you’re looking for something more casual. This restaurant is down-to-earth and the outdoor seating has a warm feel to it. The price of brunch is $40 per person and from there you are able to choose between drinks and an assortment of southern takes on basic brunch items. Many of the crowd favorites are the Smoked Bacon Scramble w/ Wilted Rocket & Apple Fried Potatoes, as well as the Duck Confit Wild Mushroom Mac N’ Cheese. The Apple Cinnamon Beignets also pair great with a fresh mimosa! Looking for a spot that’s a little more upscale? Head to Sapphire Laguna for a beautiful and sophisticated brunch with your Easter Sunday crew. The outdoor seating has great views of the ocean, and the bright orange umbrellas protect you from getting too warm. The Easter Sunday menu is a three course set menu priced at $65 per person. The first course, which is a Swiss Muesli Parfait with bananas, goji berries, pumpkin seeds, chia seeds, local honey and toasted almonds, sets the tone for the decadent food that Chef Azmin Ghahreman whips up! Your mouth will be watering just looking at the menu. Talk about an assortment of food… Back Bay Bistro in Newport Beach offers a variety of “stations” at their Easter brunch so no one can leave hungry! The different options include an omelet, pancake, smoked fish, seafood, crab cake, carving and dessert station! In addition to that, the brunch also offers a variety of foods from the grill. The Back Bay Bistro is a great place to take the family on Easter Sunday because not only to they offer a wide range of kid and adult foods, but they also offer a separate price for children and adults. To brunch until you’re stuffed at the Back Bay Bistro costs $79 for adults and $38 for children. There’s a few more bonuses… the all-inclusive price for adults also includes bottomless champagne and mimosas for the whole morning! The Easter Bunny is also set to make an appearance, so while the adults are enjoying the drinks, the kids are amused too! The Back Bay Bistro is a great place to check out for the ultimate Easter Sunday brunch. Want to try something different for Easter? Bring everyone to the Ostermarkt Easter Bazaar hosted by The Phoenix Club! Although it’s not your typical sit-down brunch, this festival will have German food, imported desserts, a German bakery, German beer live music and crafts! The Easter Bunny is also said to make a special appearance at this fun festival! There’s no cost to attend the festival and it lasts from 11 a.m to 4 p.m. If Bratwurst, potato pancakes and split pea soup sounds good for Easter Sunday then stop by the Ostermarkt Easter Bazaar! If the cocktails are a vital part of the perfect Easter brunch for your party of people, then Social in Costa Mesa is the place to go! Although it’s not a traditional, classy Easter brunch, it’s delicious and signature drinks are to die for! Brunch goers can choose from a wide range of menu items. The food ranges anywhere from something as light as market fruits to a hefty plate of chicken and waffles. The food is not where most eyes wander though when there’s such a fantastic menu of cocktails to browse! A crowd favorite at brunch is the “Magic Carpet Ride” which is a mix of vodka, Sauvignon Blanc, jasmine and grapefruit. The atmosphere inside is fun and intimate which is why Social is a popular destination for friend groups on an Easter Sunday! Take a look at their sinful menu of delicious food and drinks today! Do you care if there’s outdoor seating? How expensive is it per person? Hopefully now you have the tools to book the perfect Easter Sunday! If you have any questions, contact Stacy & Nicole today!